Finding someone that satisfies your maintenance needs on site can be a real challenge in the fast-paced world of Food Processing. Even more so when you place your trust in a provider, and take it on faith that they will carry out spot checks and surveys correctly. Sadly, this is not always the case, and Food Processing buildings can easily become unsanitary and under-maintained behind the scenes. Here are some shots HVDS recently found from a full site survey. This site was ‘maintained’ by another provider for nine years prior, however these images tell a different story. Issues like this what you see below, as well as uncleaned systems, can lead to a variety of problems later down the line. That is why it is crucial to have proper procedures and processes in place. With things like this often going undetected in plants, a site survey provided by an external and impartial provider is advised. Here we take a look at the benefits of a site survey and an effective and managed maintenance plan to avoid situations like the ones illustrated above. An air handling survey can provide you with comprehensive information about your air handling and ventilation systems. It can uncover poorly maintained systems, and highlight ways in which you can reduce risk and improve Indoor Air Quality (IAQ). 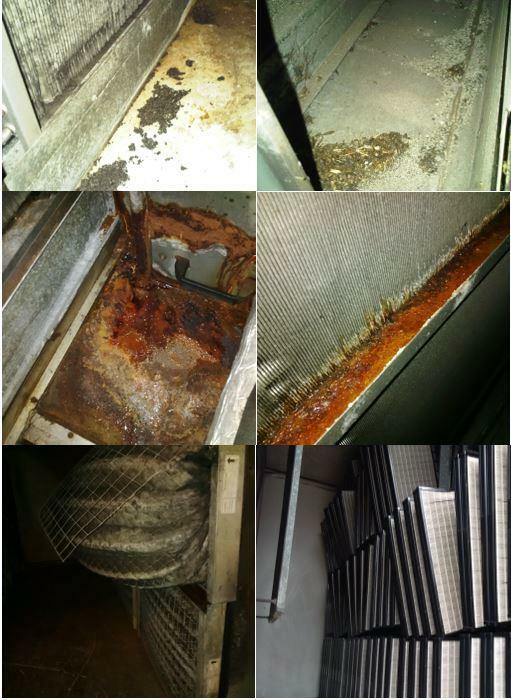 One of the biggest issues we find when completing site surveys is poorly maintained systems that are in desperate need of a clean. If you are looking to build an effective maintenance strategy, or optimise your current systems, the information provided from a site survey will enable you to make calculated decisions regarding you air handling management. A site survey will allow you to really understand what your personalised requirements are. A one size fits all approach doesn’t always work, or your requirements may have changed. A fresh survey will present you with new ideas on air filter specification or on how to improve your air mapping, or upgrade your ductwork.